Dragon’s latest figure set is suitable for creating an instant diorama scene that is full of drama. 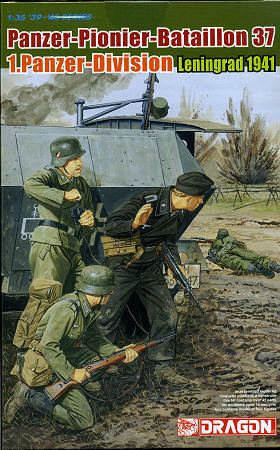 The box-top artwork of the 1/35 scale set shows German troops sheltering behind an Sd.Kfz.251/7 halftrack in the September 1941 timeframe. The set is designed to replicate soldiers from Panzer-Pionier-Bataillon 37, a unit belonging to 1.Panzer-Division. At the time, German forces were besieging the Russian city of Leningrad, and the assault engineers were tasked with spearheading attacks on defensive features such as enemy bunkers and trenches. To help them with their assigned tasks in the muddy autumn conditions, these pioneers were heavily equipped with a range of weapons and demolition charges. In this set, three of the soldiers are wearing the standard field gray uniform, while the final figure wears the black panzer uniform that was authorized for wear in May 1940. Some are also using the special pioneer assault pack (Pioniersturmgepäck) introduced early in 1941. These brand new figures carry a variety of weapons and equipment. While the four assault pioneers lend themselves to combat operations with a Dragon Sd.Kfz.251 halftrack, they can of course be matched with any other 1/35 scale vehicle the modeler wishes.